Experience craft beer and wine tasting from a huge selection of vendors, colorful art installations and live music performed by five crowd-pleasing bands. Indio, CA: The 6th Annual Rhythm, Wine & Brews Experience returns to Empire Polo Club’s fields on Saturday, March 4th, 2017. Presented by Empire Music Ventures, the 2017 line-up includes Snoop Dogg, Pepper, The Expendables, Andy Frasco and Spankshaft along with more than 100 breweries, wineries and food trucks. Craft breweries and wineries will serve tastes of regional beer and wine from 3:00 PM– 7:00 PM as guests enjoy performances by American blues artist Andy Frasco and ska-punk band Spankshaft on the Tasting Stage. Colorful and inventive art installations by day will transform into marvelously luminous arrangements at night. 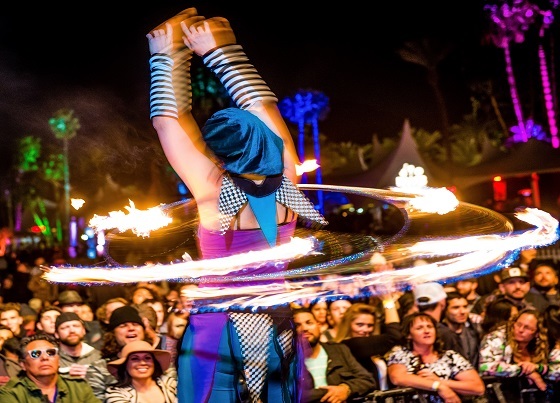 Cirque entertainers will mingle with attendees savoring the extensive selections served up in the craft beer and wine gardens. Gourmet food trucks and regional restaurants will offer a variety of mouth-watering fare ranging from spicy tacos and savory pizzas to hot sausages, thick grilled cheese sandwiches and aromatic Mexican cuisine. At 7:00 PM when the tasting portion of the event winds down, the main stage will explode starting with The Expendables. Second in line is Pepper and last, but definitely not least, the legendary Snoop Dogg will finish out yet another amazing Rhythm, Wine and Brews Experience 2017. Tickets to the 2017 Rhythm, Wine & Brews Experience can be purchased online at www.RWBEXP.com starting November 15th, 2016. *VIP Admission includes access to VIP tasting area with specialty wine and beer not available in the general tasting area, and complementary food. VIP admission also includes access to a second Locale Magazine VIP Lounge with a full bar adjacent to the main stage. On Friday, March 3rd, the Rhythm, Wine & Brews Experience will host the Locale Magazine VIP Bottle Share and Kick-off Party in the Hacienda del Toro garden at Empire Polo Club. This event is exclusively for VIP ticket holders, vendors, campers and media. VIP guests each bring a bottle of a unique craft beer to share with the other VIP guests. It’s a great opportunity to meet people and discover new craft beers while enjoying live music. For more details about the Locale Magazine VIP Bottle Share & Kick-off Party, visit www.rwbexp.com. On-site RV and tent camping will be available. Fees include two days of camping: Friday, March 3rd and Saturday, March 4th. Visit www.rwbexp.com for more details about camping on-site. Tickets can be purchased online at www.RWBEXP.com. Tickets can also be purchased at the gate on the day of the event. Children 12 and under are free. Ticket holders must be 21 years of age or older and show a valid ID to taste beer and wine. According to Wikipedia, American rapper and hip-hop artist Snoop Dogg began his music career in 1992 when he debuted on Dr. Dre’s The Chronic album. Since then, Snoop Dogg has sold over thirty-five million albums worldwide. In 2015 he released his 13th studio album, BUSH, which was produced by Pharrell Williams. The album landed at the top of the hip-hop/R&B charts and 14 on the Billboard 200. His new album, Coolaid, came out in 2016 and was well received, according to biography.com. For more information visit http://snoopdogg.com . “Hailing from Joshua Tree, deep in the heart of Southern California’s Mojave Desert, Spankshaft is a five piece pop-ska-punk band, that seamlessly bends genres to create something uniquely spankshaft. Empire Music Ventures, owned by Alex Haagen IV, is located in Indio, CA and produces concerts and festivals. These events include the Rhythm, Wine and Brews Experience and numerous concerts held at the Date Shed and other venues.